Consider the sum of two sine (or cosine) waves of equal amplitude A, with ω an angular frequency (radians/sec), δ a “small” difference in angular frequency, and φ a phase angle, in radians. Defining the arguments of the cosine sum as α and β, a basic trigonometric identity can then be used to find the product- of-cosines equivalent result. The first cosine in the product expression varies relatively rapidly, with the average frequency of the two waves, which, since δ is by definition small, will be nearly the same as either of the original frequencies. The second cosine, on the other hand, varies much more slowly with time. 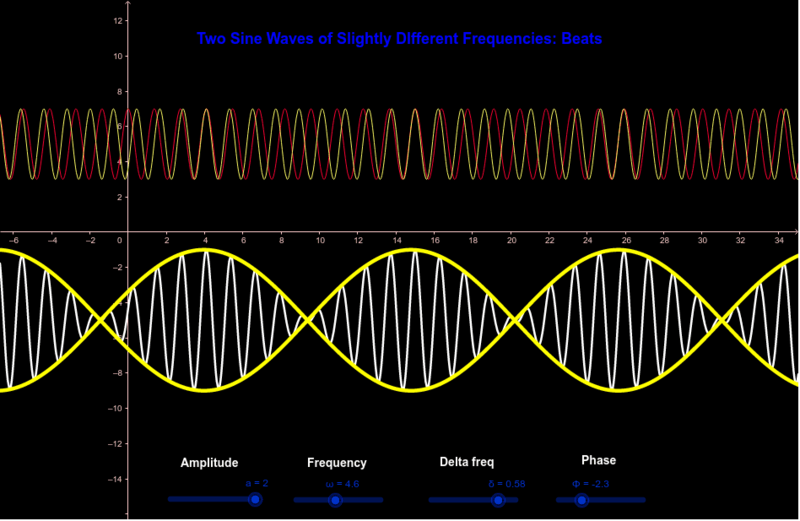 This second factor can be considered the time-dependent amplitude “envelope” of the combined waves. The effect of this, for audio signals, is to create a slowly-changing volume of the pitch corresponding to the angular frequency ω. This “beating” effect is used, for example, in tuning guitar strings; harmonics are played on certain pairs of adjacent strings, and when the strings are nearly in tune with each other there is a clearly-perceptible variation in the sound level. As the strings are brought into tune, the variation in amplitude (not pitch) becomes slower. When the strings are in tune, the harmonics do not vary perceptibly in amplitude; this would correspond to δ being nearly zero. Adjust the sliders in the graphic below to see the effect of the various parameters.